This contribution on music licensing comes from Evan Oxhorn, the founder of StockMusicMusician.com. He’s earning healthy passive royalty checks selling and licensing his music in the digital economy and explains how you can do the same. Ever since Napster came on the scene, it’s become impossible for musicians to earn money recording songs, right? I’m a moderately talented musician with a simple home studio and I’ve been earning thousands of dollars a year in passive income through music licensing. My songs have been on NPR, the Outdoor channel and Verizon’s On Demand channel, among others. Tens of thousands of people have heard my music — they just haven’t realized it. In fact, as digital media channels proliferate (apps, Youtube, your favorite side hustle podcast), the demand for affordable, licensable music keeps growing to keep up the pace. That model may be on its way out, but the new economy where part-time musicians create and license music from their homes is only beginning. You’re probably familiar with stock photos — the often-cheesy images that fill the Internet. You can go to sites like iStockPhoto or ShutterStock and search for off-the-shelf images to portray just about any concept you can imagine, from wads of cash to smiling families. Well, stock music is basically the audio equivalent. Also known as production music, these are the songs and jingles that grace commercials, corporate trainings videos, YouTube videos, smartphone apps, podcast intros, and more. Where hit songs you hear on the radio require special permission, clearance fees, and ongoing royalties for corporate use, stock music is typically sold for a one-off licensing fee. A licensing agreement spells out the terms and rights for both the buyer and the musician. Next time you turn on the TV, I want you to do an exercise. Really pay attention to ALL the background music that plays. Tune out the dialogue. Just listen to the music on the shows, during the commercials, or when you open up your streaming video apps. To make money with music licensing, those are the songs you’re aiming to make. Listen for the style of music that is hot right now. Pay attention to the types of instruments being used (especially the snare drum and the lead instruments). A few years ago it was ukuleles. Now it’s trap style drums. Who knows what it will be next? So keep your ears open. Search for those genres and see what comes up. If there are already thousands of songs, you may want to try a different style. Nick’s Notes: You’ll also be able to browse the “Top Authors” section (in the sidebar above) to see what kind of tunes they’re creating. In many ways, making stock music is like long-tail SEO. Sure, the demand for punk-polka music might not be huge, but the supply will also be limited. And you never know when your local sporting goods store is going to have an Oktoberfest sale. Going back to your listening experiment, you probably heard dozens of songs and jingles in a short time. And here’s the cool thing: musicians you’ve never heard of created almost every single one of those songs, and they got paid for it. Most TV shows simply don’t have a budget to commission dozens of bespoke songs per episode. The same is true with creative directors for advertisements. And most vloggers and podcasters are working on even tighter budgets and timelines. So they instead reach for stock music. There are lots of libraries out there selling stock music — but most aren’t right for beginners. Some only work with professional-level musicians, and others will accept anybody, but they don’t have a large audience of buyers. That means you won’t make much money, and, more importantly, you won’t experience the positive feedback loop of selling enough songs to stay motivated or improve. They have just the right combination of reasonable quality standards and a large group of buyers. AudioJungle has the option of doing songs either exclusively or non-exclusively (in exchange for a larger commission). Pond5 only does non-exclusive songs. Nick’s Notes: Exclusive, as you might guess, means you can’t list the same song in other stock music directories. Other sites like Permiumbeat.com are only exclusive. And still others, like AudioSparx.com are non-exclusive, but in perpetuity–meaning your songs will be non-exclusive forever, so you can’t move them to an exclusive library later. These sites are all reputable, but they represent different types of products. So in the beginning, stick with non-exclusive libraries that don’t last forever. Tip: Wait until you’ve got some experience in the industry before you agree to lock up your songs permanently through exclusive deals. This is going to be a gross oversimplification, but music copyright basically works like this. Songwriters own the songs they write and, separately, they also own the recordings they make–these are two separate sets of rights. Buyers can’t use a song without permission from both the songwriter and the owner of the audio recording. In this wonderful world we live in, permission is usually given in exchange for money. To simplify the process, music libraries get pre-approval to license songs and group together portfolios of thousands of recordings. This makes it convenient for buyers to quickly find the right song and secure the rights to use it. Note: Much like with software, they are only buying a license to use your song. 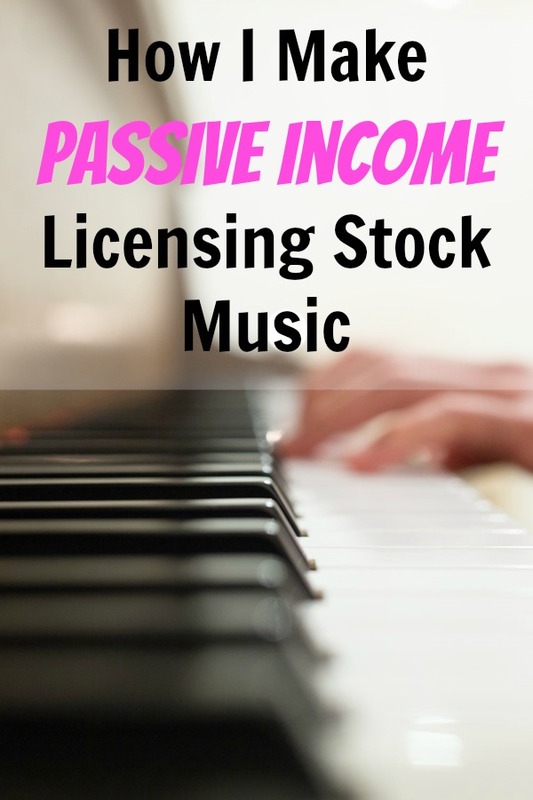 You still retain all of your rights, and can continue to license your song over and over again, continuing to earn passive income from a single recording. So How Do You Get Paid to License Your Music? Libraries like AudioJungle and Pond5 charge the buyer the Sync Fee directly, take a commission for facilitating the transaction (usually between 40-60%), then send you a check. 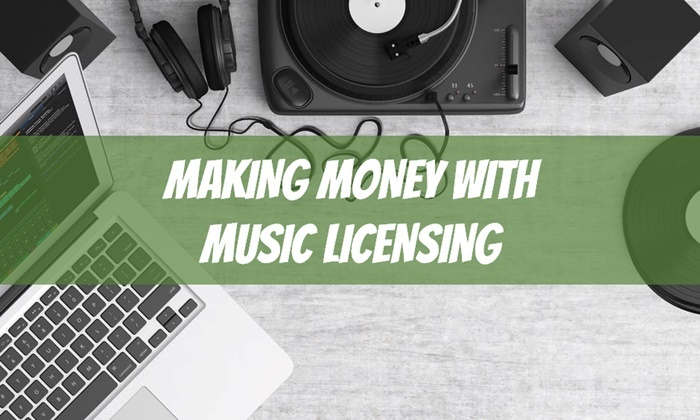 Every time a buyer purchases a license for your song, you get paid. These licensing rights vary from less than $10 to $400 or more depending on how the buyer intends to use the music. Pond5 gives artists a 50% commission, which is where I get most of my sync money from. How did I get an $1,800 check for having a 25 second clip of a song played on a Romanian TV show? Performance royalties are generally due to songwriters every time a song is publicly performed or broadcast on a large scale. In order to publicly broadcast music, everyone (from NBC to your local sports bar) has to secure a license from a Performing Rights Organization (PRO) like BMI or ASCAP. At the end of a quarter, your PRO sends you a check based on the frequency with which your song was broadcast. And you get paid again every time that episode is rebroadcast! You have to sign up with a PRO (I recommend BMI), and register all of your songs with them. Most of the buyers on Pond5 and Audio Jungle are not going to use your music in a way that generates a public performance royalty, but the pay day is so big that it’s totally worth your while! There are also a couple of alternate business models you can use if you’re more advanced. This is how Side Hustle Show guest Cathy Heller built her 6-figure music licensing business. With this model, you’re much more likely to generate a PRO royalty and the sync fees are much larger. You also make a lot more money for music with vocals, but unless you’re a very good singer (I mostly do instrumentals), you’ll have to hire someone, which gets expensive. If you’re songs aren’t professional studio quality, don’t send them to supervisors. You will NOT get placements, and you’ll risk burning bridges and getting a bad reputation in the business. What type of songs should I make? How do I make songs that are commercially viable? How do make I more songs? What keyword and tagging strategies are the most effective? These are all huge topics and I could talk for hours about them. But here are some quick answers. What Types of Songs are Best for Licensing? Almost any type of song can sell–if it’s done well. For instance, the need for bagpipe music might not be that huge, but there also aren’t a lot of people making it. Conversely, upbeat pop music with a ukulele is incredibly popular with buyers, but the market is very saturated with sellers. Your song would need to be really good to stand out. Because it takes a while to start earning money in this business, and it’s still not a massive income, I recommend to my students make music you enjoy. If you’re already enjoying making the music, any money you earn on the side is just a huge win. One of the main things I teach in my course is the importance of a strong beginning and end to a song. Minor tweaks can make a huge difference. You need your song to immediately establish its vibe, and then to end strongly and resolutely. You also want to keep songs within a single mood–no manic changes between verse and chorus. Finally, you need to keep things moving along. People generally want songs that have a forward arc to them, not simple loops. You’ll also want to chop your songs up into shorter versions. So just a quick 5-second ending, or a 30-second chorus, or maybe a funky breakdown. Plus this gives you more opportunities to get in front of buyers. At the end of the day, music licensing is really a numbers game. You need to have the right song at the right place for the right buyer. The more songs you write, the better your odds. I’d estimate that I probably get one sale a month for every 30 files I upload. This includes the main songs and the 5 or 6 alternate versions you make. After commission, I make $10-20 per sale. So the more songs you can make the better. Here’s how the math tends to work out for me. If you make one song a week, you’ll probably end up with somewhere in the neighborhood of 30 files a month, and then one sale. The next month you add another 30 new songs, while the old songs are out there still selling for you. For example, I just got the first sale of a song I recorded a few years ago. Music licensing isn’t a get rich quick scheme, but it does keep on building. If you love making music, it’s a great way to earn extra money. As you add your songs to more libraries (assuming they’re not exclusive), you’ll be able to create more sales opportunities per song. Nick’s Notes: Put more “Buy Buttons” out into the world and let people do business with you. You need to improve your skills as a songwriter and a producer/mixer. The more you practice the better you’ll get. You never know what people will want, so it pays to cast a wide net. I’m constantly surprised by what sells. In order to make more songs, you’ve got to get better at honing your instincts. A lot of people are unwilling to commit to a sound or an effect, but this will really slow you down in the long run. Lock in your sounds and move on. Don’t be afraid to use loops, samples, or instrument presets. And it really helps to create templates in your recording software so you have your favorite sounds ready to go once you’ve figured out where your wheelhouse is (i.e. one for gangster rap, one for trap, one for old school hip hop). Don’t let perfect be the enemy of the good. If you work hard on your production skills, you will end up improving by leaps and bounds. Your best song is always going to be the next one you write, but that doesn’t mean you should wait to release the current one. 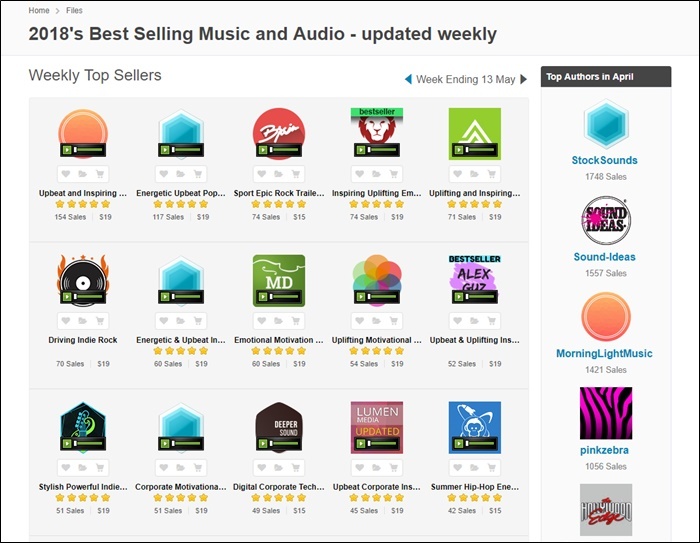 Sites like Pond5 and AudioJungle are essentially just big search engines. You have to upload your files and provide your own keywords and description so that buyers can find your tracks. If they can’t find your music, they can’t buy it, and you can’t get paid. Some best practices for keywords include using as many as the site allows. You want to focus on the emotions and mood that the song brings out, and you also want to be descriptive in terms of what the song sounds like. Finally, you may want to brainstorm some of the best uses for the song you could think. For example, if you’ve got an upbeat ukulele song you might use keywords like: summer, love, coffee shop, ukulele, upbeat, happy, peppy, carefree, road trip, millennial, etc. You can also save yourself a lot of time by writing/uploading songs in clusters. Because of presets, tuning issues, instrument choice etc, you can probably do 4 death metal songs in a weekend much faster than doing a bosa nova, a waltz, a classic rock song and a death metal song. And as a bonus, you can re-use most of the same keywords! I’ve put together a free 5-day music licensing crash course on my site for Side Hustle Nation readers that goes into much more detail on how to write the right types of songs. You can learn how start licensing your music here. Evan Oxhorn has been making music since second grade, but got started trying to figure out the music licensing business in 2014. Since then he’s earned thousands of dollars and secured placements on TV and Radio stations around the world. Inspired by an episode of The Side Hustle Show, he created the Stock Music Alliance to help other aspiring musicians pursue their music licensing ideas. Hey Evan here, just wanted to let you know I’ll be checking in from time to time, so if you have any questions, just let me know! Awesome article, Evan, thanks! And congrats on your $1800 licensing fee. You continue to inspire me to keep working on my own music. Best wishes for continued success! This is a great guide. I have experience with selling stock photos but have never thought about music licensing. Are there any specific marketing tactics you use to drive buyers to your music? Thanks Kevin, I haven’t really found that I was able to move the needle too much in terms of driving sales. I know some of the big artists have Youtube channels with links to their music (look at Basspartout on Youtube). The problem is that most of the people viewing his channel probably don’t need stock music. So if you’ve got a direct line to purchasers, marketing may be helpful. But then again, you may want to try licensing the song directly to them and cutting out the middle man. Really good info and inspiring! You give hope to aspiring artist! Thanks! God bless you for giving back! Finally! 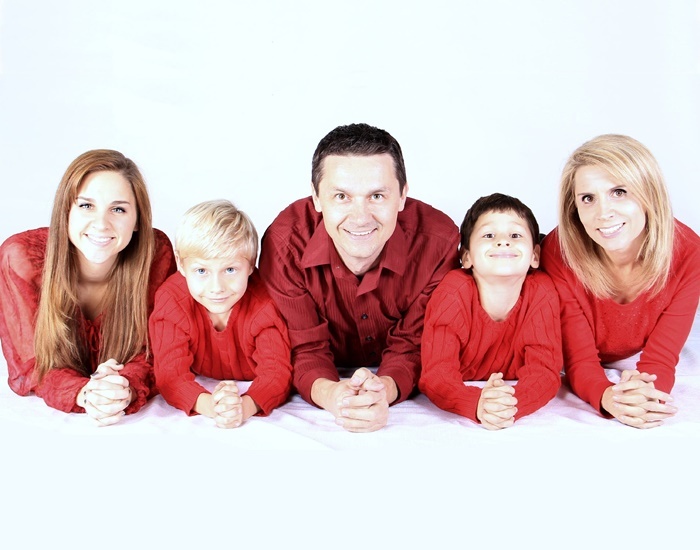 A platform where my musically talented children can put their passion to work for them. Thanks for this informative article. Thanks for this article! I am just getting started building my library. I have been making music for about 10 years and have done so in a few professional settings, but I am excited to make some songs here. I have a lot of systems in place where I can make 5-20 songs per week (thanks to a lot of free time) and I am hoping that will start generating some sales within the first few months. This article makes me feel like it’s possible! Would love to hear a few more statistics about the sales. How did you split one song into 5-6 different uploads? Would like to hear more details about that as well. Do you file copyrights on the tunes before you upload?